A few weeks ago I flew out to my parents’ place to look after their dog while they were out of town. 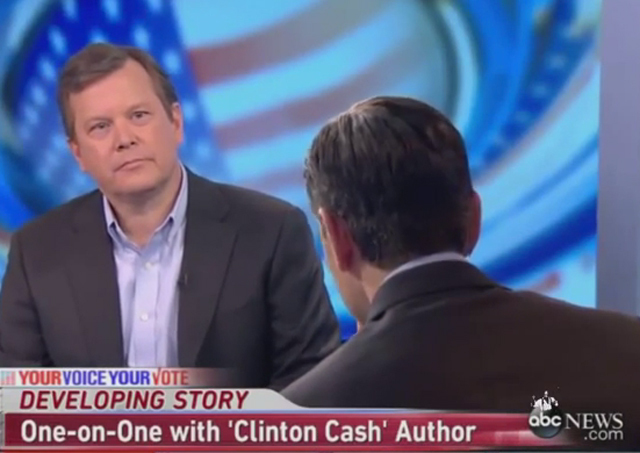 Before they left, my dad was watching George Stephanopoulos grill “Clinton Cash” author Peter Schweizer (who handled himself quite well, all things considered). I told my dad that it irritated me that guys like Mr. Schwizer don’t call out Mr. Stephanopoulos out on his close ties to the Clintons (George was Bill’s campaign manager) because young voters and your run-of-the-mill ABC News viewer is not familiar with such details. Yesterday my rant became moot. 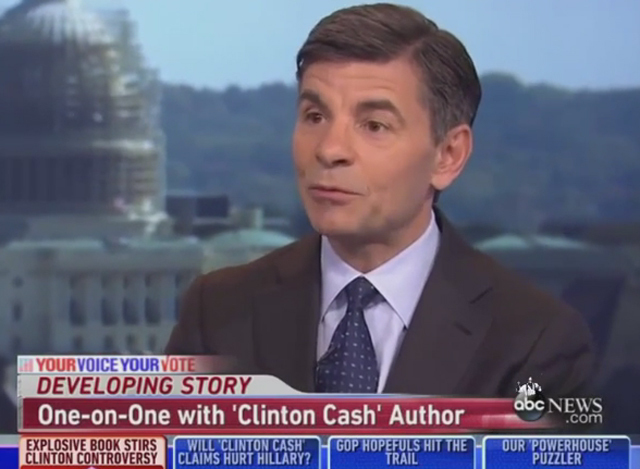 The Washington Free Beacon revealed that Mr. Stephanopoulos donated $75,000 to The Clinton Foundation. When the Beacon asked ABC for comment, the network then ran to Politico to make it look like it was out in front of the story. Former Clintonland insider George Stephanopoulos, who has excelled at both politics and journalism, appears to have failed both professions with a single transgression. In shelling out $75,000 to the politically identified Clinton Foundation, Stephanopoulos has […] torched the journalism-cred he has acquired in the past two decades, and obviously forgotten the lessons in political savvy he learned as a member of Bill Clinton’s inner circle. He knew going into ABC News that his reporting and his personal actions would be extra scrutinized for bias. I find it implausible that he did not understand in 2012, 2013 and 2014 (the years he gave the Clinton Foundation cash), that his contributions would be an issue with his employers and his viewers once discovered—even if they were just sitting there buried on a website for anyone to stumble upon. Something like this used to be a big deal. ABC’s host is seen by millions of people. He professes to be a fair and impartial journalist. His failure to disclose $75,000 in donations to The Clinton Foundation — prior to roasting a critic of The Clinton Foundation — is not an “honest mistake.” There should be repercussions, but yet it appears ABC is reluctant to hold its talent accountable for his behavior. Indeed, George’s donations were all public record — for all those casual ABC viewers who dabble in investigative journalism in their spare time. According to George, it is also not about journalistic integrity anyway because it’s really about “children,” AIDs victims, the environment, and poor people. The story only gets better, because it turns out the producer who tried to do an end-around the Washington Free Beacon — Heather Riley — also worked for the Clintons. Do you still think the media isn’t biased? I hope not. On April 17, I wrote on the “Rings” of Washington, D.C. The nation’s capital is a professionally incestuous city that I’m happy to have left behind one year ago (I work remotely from my secret underground bunker these days). Regardless, the point is that George Stephanopoulos is in many of the “right” rings and will therefore have very powerful people working overtime to protect his career. If he survives professionally at ABC, then it is incumbent upon future guests to remind viewers about this scandal when appropriate. If ABC had its way, then it would keep millions of viewers in the dark to a very damning fact: its star talent, which is covering Hillary Clinton’s run for the presidency, wants desperately for her to be elected. It’s pathetic that ABC won’t can this clown. Last night, I was watching Megyn Kelly and Geraldo Rivera was on, saying that he was fired in the mid-1980s by the same person who hired Stephanopoulos, for donating $200 to a friend who was running in a non-partisan mayoral race in New Hampshire. The same news editor also blocked Rivera from reporting on a story about the Kennedys’ connection to Marilyn Monroe’s death, but according to Rivera, the donation was the last straw as far as the editor was concerned. So basically, he was fired for no real reason, but Stephanopoulos (a former Clinton insider) gets a pass. And Megyn noted that if she donated money to say, the Jeb Bush Foundation, she’d never hear the end of it from the MSM. Like I was telling a friend of mine: the double standards are just amazing. If a white professor said black men were a “problem population” that needed to be taken care of — and that he went out of his way to avoid black-owned businesses — he’d be gone. Ms. Grundy over at Boston University just needs to make her Twitter account private and essentially say that she’ll cover her tracks better in the future. Now, with Stephanopoulous, he and ABC just say that it was an “honest mistake” and move along…move along…nothing to see here. We’re supposed to just accept it. No. I’m not going to accept that. Future Republican guests on his show better make it a point to bring this up every time he starts acting like an advocate for the Clintons during the 2016 election season. Yeah, I don’t forget things like this, either. I’m not going to accept Stephanopoulous’ “apology” and move on. People need to push back against clowns like him. It’s amazing how these double standards are fine with the left. Rivera donates money to a friend running in a non-partisan mayoral race, but gets canned by ABC. Stephanopoulous donates to the Clinton Foundation (run by his former boss) and he keeps his job at ABC. It’s pathetic. I’m not surprised that George donated, but I am amused that Stephanopoulous of all people has to pay for access to the Clintons. What DOES boggle my mind is the revolving media door that allows apparatchiks to find work in the journalistic field with so little questioning. If George would just admit that he’s a Clinton hack, then I’d be fine with him doing these sorts of interviews. Let him openly admit where he stands and then let others who disagree with him come on and have their say. What bothers me is that guys like him will go to great efforts to create the illusion that they’re neutral observers when it’s a lie. The “revolving door” you mention is alive and well. Exactly. I mean, it’s one thing for Fox to keep hacks like Rove on the payroll to give them a few minutes of airtime now and then, but there’s a difference between a pundit and journalist that most networks (and sadly much of the public) has seemed to have forgot.